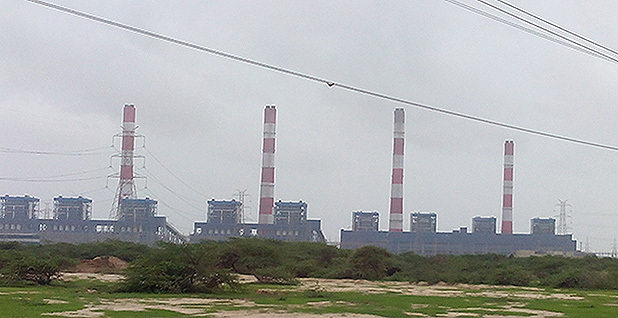 Adani Power Ltd.'s Mundra thermal power station in India. Photo by Nizil Shah, courtesy of Wikipedia. India's energy landscape is changing so swiftly that researchers are having a tough time keeping up with it. Prospects for the country's coal sector continue to drop along with the falling price of renewable energy. Some situations seem to be developing in the time it takes to get a research paper out. In July, for instance, the nonprofit CoalSwarm conducted a survey of proposed coal plants in India and found 370 in the pipeline, amounting to around 243 gigawatts of power. The survey came a year after an International Energy Agency projection that India would be responsible for around half of the coal-fired power capacity added globally until 2040. A research paper based on the survey, which was released recently in the American Geophysical Union journal Earth's Future, determined India would be unable to meet its commitments under the Paris Agreement if all those plants were built. But between the time the survey was conducted and the time the paper was written, the Indian government concluded it would not require any new coal plants for at least a decade. About 50 GW of planned coal capacity has either been shelved or left inactive, and the country has targeted a 275-GW renewable energy share for 2027 instead. "When I worked on this back in June, I thought, wow, these coal plants are really going to lock out renewables," said Christine Shearer, a senior researcher with CoalSwarm, regarding the study. "But now they're getting so cheap and increasing so far that I'm thinking that no, they're not going to end up being stranded. It's amazing how quickly things are changing." India accounts for about 4.5 percent of global greenhouse gas emissions. As part of the Paris Agreement, Prime Minister Narendra Modi vowed that by 2030, at least 40 percent of the country's electricity will be generated from non-fossil sources. The goal includes 175 GW of renewable energy capacity by 2022. Shearer and her colleagues note in the research paper that India's climate goals, which include reducing emissions intensity by around 35 percent of 2005 levels by the end of the next decade, would be a distant dream if planned coal projects were to be completed. Moreover, said Shearer, many of the proposed plants are simply unneeded. "India has been pursuing a lot of power bids recently for solar and wind, which are coming in even cheaper than coal. So what we're really seeing is kind of the vestige of the previous perception of coal being a way to meet power needs, now coming up against a new reality where renewable power can deliver the same thing," she said. It's also extremely unlikely that the planned capacity, even excluding what was abandoned by the government since the middle of 2016, will actually reach fruition. Coal capacity and demand statistics for India are frequently inflated, said Navroz Dubash, a senior fellow with the New Delhi-based Centre for Policy Research. Partly, he said, it's because operators bid for power plants only to access government concessions. Another reason is that India's electricity consumption is low and many assume that coal is a critical part of boosting that figure. "But since last year, operational capacity factors gave began to fall — which means each power plant is being used for less and less time — as a result of a few things. There's been a steep drop in the price of renewables, bringing solar and wind close to competitive and making people more jittery about funding coal," Dubash said. Another reason, which is often overlooked, is that energy distribution companies in India are also reducing the amount of power they buy because they haven't been able to raise tariffs. "So you have this curious situation where India, in the last two years, has gone from being undersupplied to oversupplied, even though 300 million Indians are still without power," said Dubash. "This is an artifact of distribution, it's because of being institutionally in bad shape, but it's going to affect all forms of power, whether coal or renewables." The big question for many experts is why, knowing that there's an oversupply in the market, projects that are currently in the pipeline aren't being shelved. The answer, suspects Greenpeace senior campaigner Ashish Fernandes, is bureaucratic inertia. Between 2009 and 2014, India went through a sort of free-for-all phase in terms of coal, where the grid didn't have enough power, the economy was doing reasonably well and markets had been deregulated. "Anyone who wanted to build a project could apply for permission and get loans in place. Many industries were looking to cash in," said Fernandes. He thinks that many operators are still holding onto the chance that their projects will eventually be approved; the lure of government concessions, particularly control of land, is enough to keep them hanging on. But savvier operators are already backing away from coal, and he remains skeptical that many of the projects in the pipeline will actually be built. "The financial case for coal just doesn't exist in India anymore," he said. But the possibility that all the plants currently in the pipeline will be built cannot be ruled out, warned Steven Davis, co-author of the paper and an associate professor at the University of California, Irvine. "I'm skeptical that they will be able to completely halt coal power plant construction for the next decade," he said. "That's mostly not because of needing electricity, but because of some sort of industrial inertia in the system. The folks negotiating these climate agreements are not necessarily the ones deciding whether a power plant will get built." This could lead to one of two situations: Either many of these plants will operate at a fraction of their full capacity, which would be a financial drain, or the economy will continue to rely on coal, which is perceived as much more reliable, and renewable energy capacity will end up wasted. "And if all the plants proposed as of mid-2016 are built, it would be a real struggle for India to meet their [Paris] target," Davis said.